Sadly money talks very, very loudly. More loudly than health issues and their very real but indirect (unless you have to meet them) costs. Thanks E.C. So very, very true. Big Hearth does indeed have a lot of money, and it can be quite disheartening. Oh, my! I knew it couldn’t be good, but I had no idea how bad it was. Good luck with your efforts! Thanks, Amy! I appreciate the support. In the 1980’s I lived in the woods (hippie) with only a wood stove for heat. I was never, ever so sick as i was during those smoke filled winters. I ended up with a chronic condition called pleurisy which is usually only found in smokers. I don’t smoke. Anytime I get a bad cold now, my pleurisy starts up. I have been saying that wood smoke is bad for people for many years now. I am glad to know it is finally getting some attention. Thanks so much for your comment. I’m sorry to hear about your pleurisy. The links I put are only the small tip of a large iceberg of research and info. 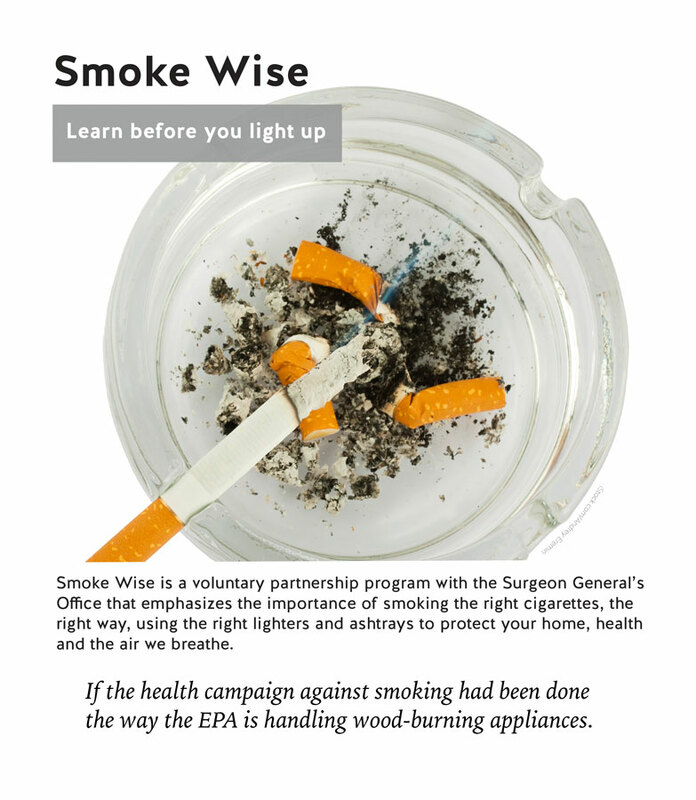 Basically, any health problem that cigarette smoke causes, woodsmoke also causes. It is very unhealthy. I live in a woodsy place and, as you know, a LOT of people burn in areas like this. People think we have clean air, but we don’t. A dear friend of mine recently died of COPD. I think he’d smoked a bit when he was younger, but in the last several decades his main risk factor was woodsmoke. He didn’t have a car and walked a lot — often for miles — in our smoke-filled air. Our smoky county has a much higher rate of COPD than the rest of the state. He was 64. It’s completely heartbreaking. At any rate, I’m glad you don’t have to heat with wood anymore, and I hope you stay well! Thanks for reading my blog. I always enjoy seeing your interesting designs and artwork that you post online. It was nice to see you here. Thank you for the work you’re doing to help raise awareness and to help create positive change. Cathy! So nice to see you here. We are all in this together. I know you’re an artist as well — I really enjoyed looking at your paintings online. Thanks for reading my blog, and for your comment. I thank you too, very much, for all you do to raise awareness about woodsmoke pollution. We loved our double-burn wood stove at the former house.But we lived in a relatively open area,ie not suburbia, and our climate [then SE Queensland, for benefit of American readers] was far from Nthn California. But suburban backyard fires [incinerators and bonfires] had been banned for some years, probably mainly because of fire dangers in our climate, but certainly with a nod to healthy environments. None of which addresses your problems! I wish they’d ban bonfires here — we still have people burning in their backyards, on top of all the wood stoves. I must say, when I think of your part of the world, I think of a climate hotter than Hades… ! Thanks for still checking in on me. Thank you, Paper Chipmunk for teaching people about wood smoke and the harmful effects thereof. I defy anyone who reads this to try and refute the fact that wood burning needs to be banned. Thank you so much for sharing your experience, and also for sharing the link to The Fireplace Delusion, which is indeed a very good essay on the topic that I also highly recommend. It’s reassuring to know that there are people out there who did burn wood, but have changed their minds after learning more about it. It gives me hope! Dear Ellen thanks so much for posting and educating me. I was totally unaware of this. There is a big trend for wood burners in the UK too. You can smell the wood burning some evenings where I live and according to the link you posted, if you can smell it this is not good. My boyfriend has been nagging me to get a wood burner for our house – I have been saying no – my argument has been – I don’t really like them, I think they are a bit of a craze and in 10 years time everyone will be ripping them out. Greetings Angela — You made my day, if this post stops you from getting a wood burner! Especially if you have asthma — even mild asthma — you absolutely do not want to be breathing wood smoke. If you have asthmatic neighbors, they’ll also appreciate you not getting a wood burner. The increasing popularity of wood burners in the UK amazes me, given the history of air pollution problems over there. So much was done to clean up the air over the last several decades, and now it seems they are moving back in the wrong direction. It’s sad and frustrating. Thanks for the update! You made my day! I didn’t know that woodsmoke was more harmful than cigarettes! You won’t believe the amount of cigarettes Siciians smoke. They start at 12 or so! Thanks for stopping by, Francesca. I think I can believe the smoking rate in that part of the world, alas! A lot of wood burning too. Italy in general has one of the highest rates of household wood burning in all of Europe. One of my dearest friends, who was a heavy smoker, was an American of Sicilian ancestry. Maybe the cigarettes was his way of keeping in touch with the ancestral homeland!